In theory, people living in Darlington should have had two stellar fine dining restaurants to choose from for the last few years. To the north west of the town, James Close and his small team turn out dishes of pristeen and precise flavours from their tiny kitchen at The Raby Hunt. It continues to offer the very best cooking in the North East, earning it the region’s only Michelin star, and a solid 6 stars on my last two visits. 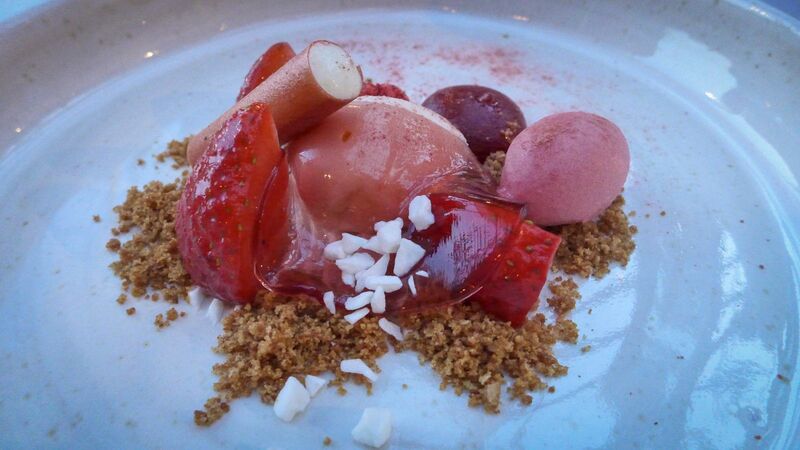 Close is a genius; if you haven’t yet eaten there, you should book today. 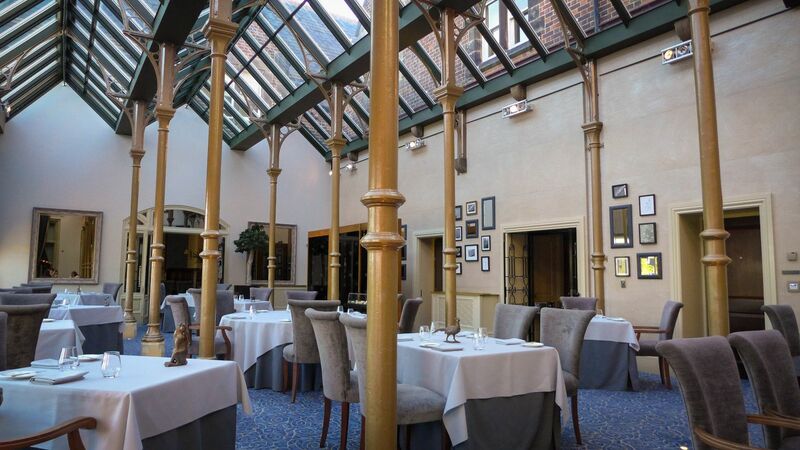 Meanwhile, immediately to the south is The Orangery, centerpiece of the formidable sprawl of hotel, golf course and spa that make up Rockcliffe Hall. Except that’s where, up until now, things have gone a bit awry. 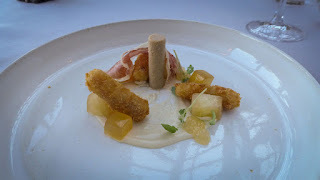 I found two previous meals at The Orangery uninspiring and littered with errors. On the first occasion it was during the tenure of Kenny Atkinson, although tellingly he wasn’t on the pass that night, and the food was poor. Kenny’s excellent House of Tides in Newcastle (also 6 stars) has more than redeemed his reputation – it should earn its first Michelin star this Autumn. 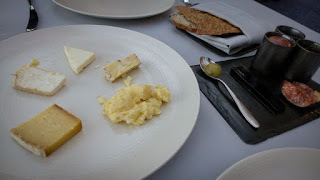 My second trip to Rockliffe, during the interregnum between Atkinson and current executive chef Richard Allen, revealed a great wine list and not so great food. A top class hotel deserved better. You might think that some sort of sadistic schadenfreude is gained from panning the efforts of notable chefs in these posts. Not a bit of it: I want to see all the destination restaurants of our region do well, partly because the North East deserves it, but mostly because I want to enjoy my own dining. 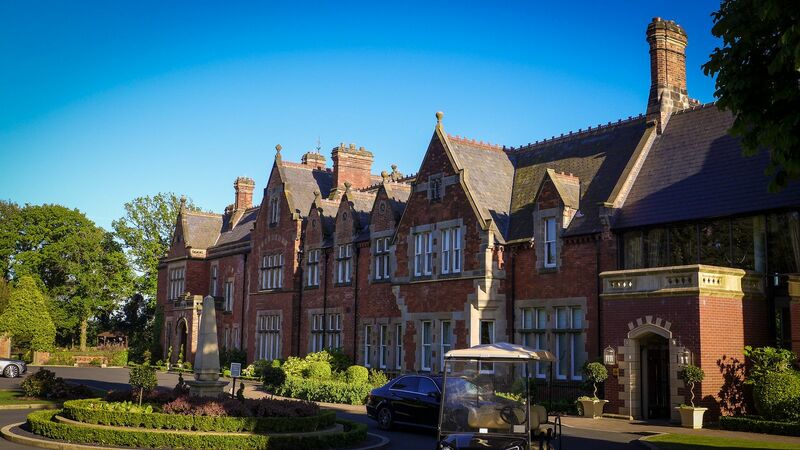 That’s is why I am delighted to report that in Richard Allen, Rockcliffe Hall has finally found a chef with the right formula for their flagship. He arrived in January from the Grand Jersey Hotel’s Tassili restaurant, where he held a Michelin star himself. This man knows about the difficulties of running fine dining in parallel with the other demands of hotel catering. 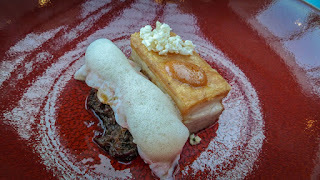 And he also has a particular vision and style of cooking, which shone through our dinner there last week. Mind you, the room is still a forbidding oversized greenhouse – no prizes for ambience here. It looked as good as it could on a beautiful early summer evening as we sat watching the shadows lengthen over the championship golf course. They’d evidently given the pianist the night off, replacing him with an awful easy listening CD, circa 1995. If you were a fan of Simply Red, you would have been in your element. I am not. The meal began without fanfare, some slightly doughy black pudding bread rolls served in a “cute” sack and an amusing-enough bouche of smoked bacon risotto flavoured with the zeitgeisty Basque spice piment d’espelette. However, the first real clue that there was some serious cooking going on was the overture of our “Land and Sea” tasting menu. 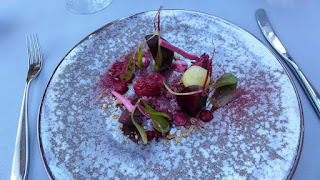 Essentially a beetroot salad, I counted at least 6 different preparations of the root - some baby shoots, an ice cream, dainty batons of meringue, and alongside a superb fritter of Valencay cheese, a swoosh of goat’s curd and some toasted hazelnuts for crunch. 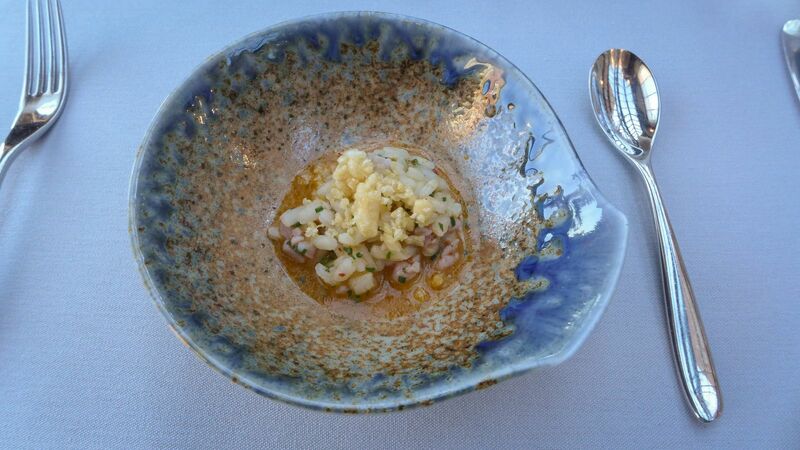 For such a complex dish, there was a lack of affectation. A classic combination of contrasting textures and temperatures, brilliantly fitted together, and complemented by an excellent Chilean sauvignon selected by sommelier Grace Matterson. It completely took my mind off the Hucknall and set the tone for the rest of the meal. My dish of the evening followed: a pearlescent finger of sea bass, ably supported by picked white crab, textures of tapioca and quinoa, a shard of green broccoli and a sensationally well-judged saffron foam. Saffron can so easily overpower, and I can generally live without foam, but this was superb. The verdict here would have been a six, but this level of excellence is hard to sustain, and the final two savoury dishes reminded us of better renditions of similar ingredients we’ve had elsewhere. One plate brought together smoked eel and duck liver parfait but could only remind us of what is, to my mind, the best thing you can eat at The Raby Hunt. This lacked the magic dust that I swear James Close sprinkles over his version. Next, pork and langoustine sat at odds in a surf and turf dish of Asian flavours, notwithstanding the beautiful quality and light cooking of the crustacean. She wistfully chased the remnants of the dish round a beautifully glazed bowl, as if looking for the missing sparkle. She was right. These ingredients were working against each other, rather than together, and the skin on the belly wasn’t properly crisped. Shame. A juicy glass of Penfolds Bin 28 Shiraz cheered it up. The cheese trolley contained several British gems and an impressive array of accompaniments, including truffle honey, a perfect match for goats cheese. Desserts were both more complex arrangements of bits and pieces, one on the theme of strawberry, with fresh fruit, jelly, ice cream and a spherification, the other combining chocolate and pistachio to fine effect. 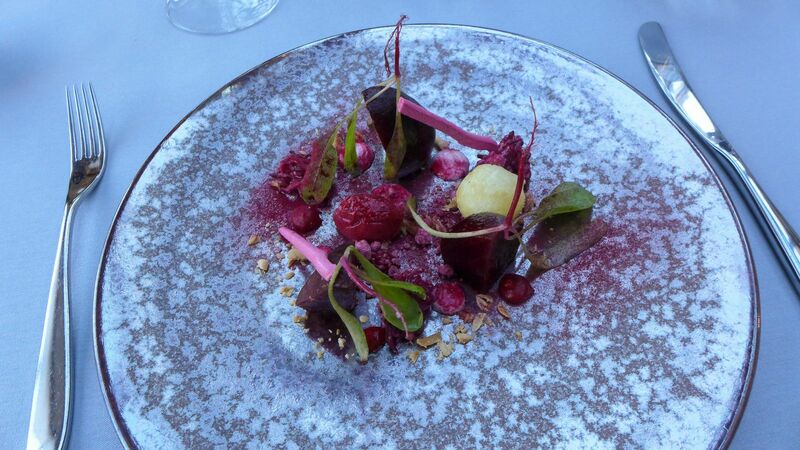 As with the beetroot dish, these were intricate but not overworked, not an easy balance to strike. Service was superbly warm and knowledgeable throughout. On what was a relatively quiet evening, too much formality would have felt like a farce. The team at The Orangery, Jonathan and Grace, got the balance exactly right. The meal cost £75 a head for five courses, not including drinks. Before some of you rush to complain, I should say that this is perfectly reasonable for fine dining of this standard, and far less than the cost of a similar meal in London. But, yes, it’s definitely for special occasions only. 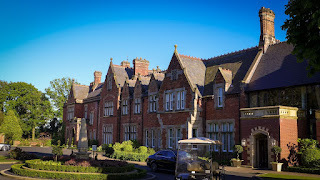 In one sense, a comparison between Rockcliffe Hall and The Raby Hunt is futile; one is a plush, hulking brute, the other a dinky gem. 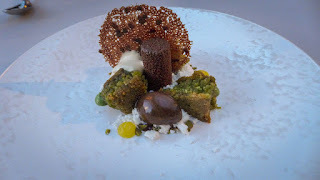 And yet, in terms of the food, there are now, thankfully for Rockcliffe Hall, some similarities. Both have a knack for making the complex look natural. Both refuse to restrict themselves only to the North East’s larder, but take inspiration and flavour from where they feel they ought. 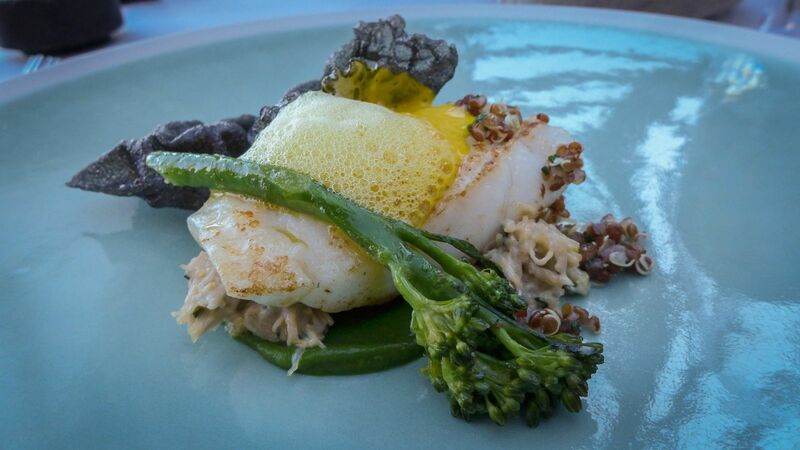 And, most importantly, both offer the North East fine dining that will reward a journey. It’s a pleasure - and almost a relief - to be able to heartily recommend the cooking here. I wonder how long it will take the Michelin man to catch up.